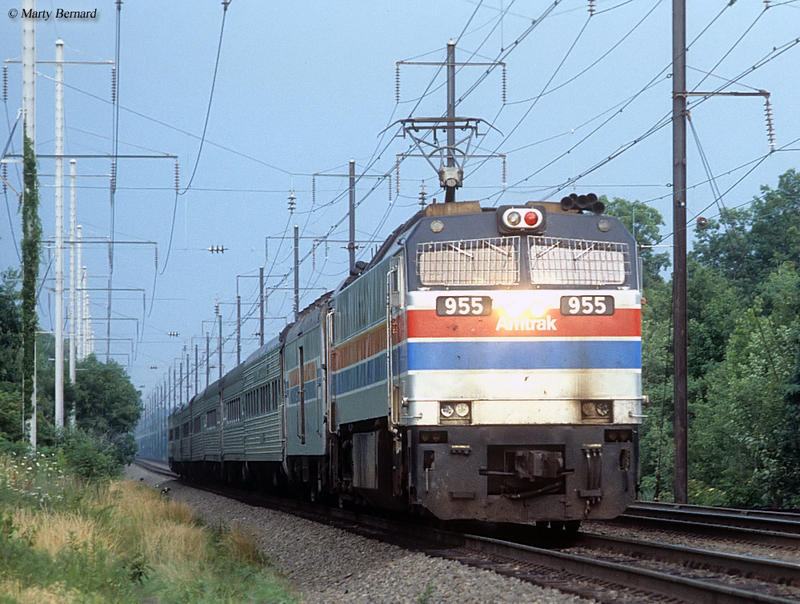 The General Electric-built E60 was the first new electric locomotive design built in the post-Amtrak era when the private freight railroads no longer operated passenger trains. This much more powerful motor was designed exclusively for passenger service and meant to replace an aging fleet of electrics that Amtrak had inherited from freight railroads, notably the Penn Central who was operating a fleet of motors that dated back decades and were completely worn out. 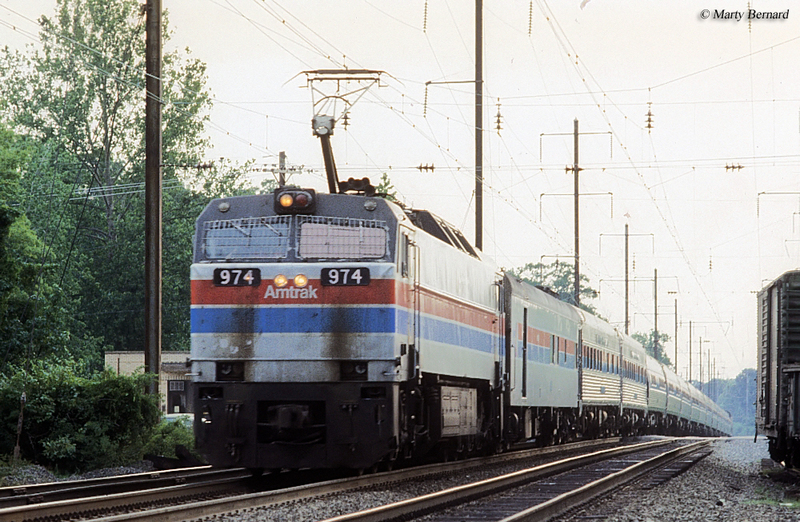 After almost 30 years of operation the E60 model was retired by Amtrak in 2003, worn out themselves from decades of constant use. Today, a few of the electrics have been preserved including Amtrak #603 and NJ Transit #958. 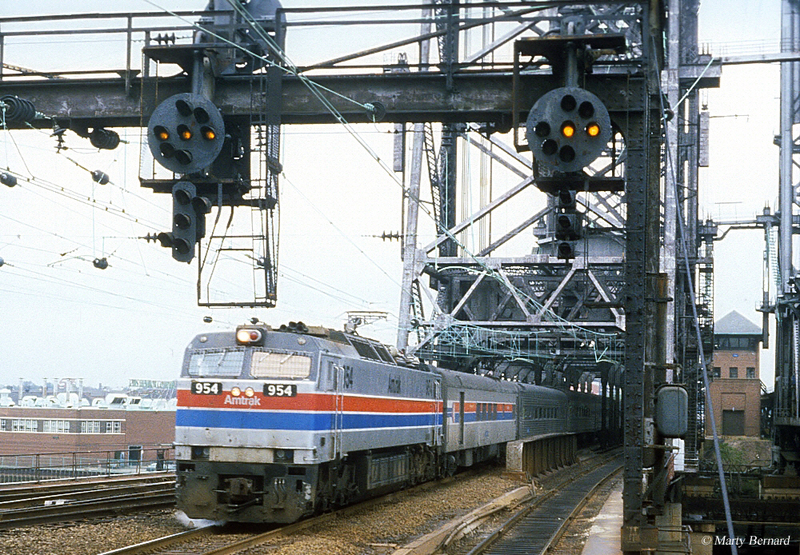 The GE E60 model, a double-ended design, was built for Amtrak between 1974 and 1976 to replace its aging fleet of electrics handed to it from Penn Central, mostly in the way of the Pennsylvania Railroad’s venerable GG1s. The E60s were powerful locomotives capable of producing 6,000 horsepower and 75,000 pounds of starting tractive effort (which is where its name is derived; Electric, 6000 hp). Two versions of the E60 would ultimately be built, one classified as an E60CP, which featured a steam generator for older passenger equipment Amtrak operated and the E60CH, which was equipped with the more modern head-end electric power for heat and electricity. 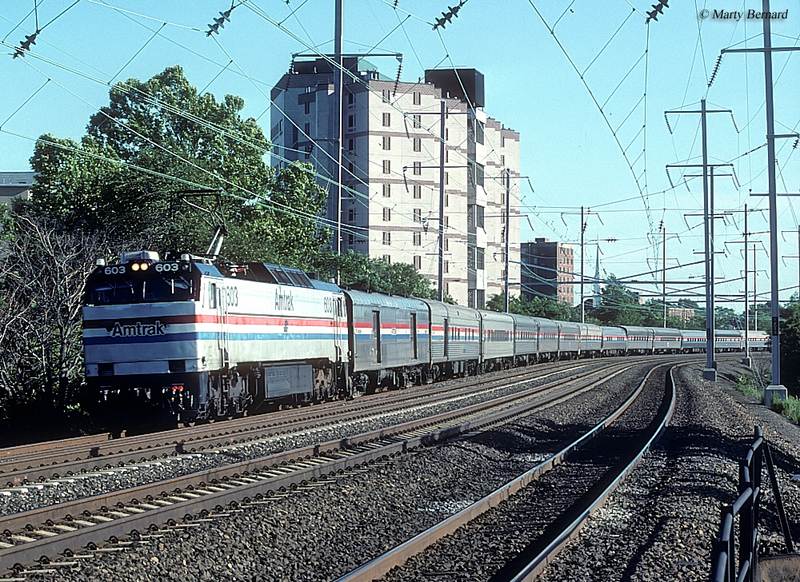 In all, Amtrak owned a fleet of 26 E60 electrics although the motors had a relatively short service life. Interestingly, as mentioned above the fleet had a mixed setup of nineteen units featuring new head-end power while seven used older steam generators to compensate for the large collection of antiquated passenger equipment Amtrak inherited. The passenger carrier was never truly pleased with the E60s and sought another more efficient and effective motor to serve its North East Corridor territory. The railroad would eventually settle on the AEM-7 model in the early 1980s, which was a design quite similar to a Swedish Rc4 motor. With the arrival of these new locomotives in 1984, after just a little over ten years in service Amtrak parked most of its E60 fleet. Eventually twelve of these locomotives were sold to two other railroads, New Jersey Transit and the Navajo Mining Railroad (now known as the Deseret Western Railway). Those fourteen that remained were reclassified as E60MAs (the MA stood for Motor Alternating) and operated for almost another 20 years before being retired in 2003. Perhaps indicative of the times by the 1970s and the main line railroads' increasing disinterest in using electric locomotives in regular service the GE E60s were problematic with a number of flaws, mostly stemming from their heavy weight. The locomotive was designed to be operated at speeds of up to 120 mph. However, its heavy weight caused the model to lean when operating at speeds in excess of 100 mph, resulting in the locomotive becoming unstable. As a result the Federal Railroad Administration limited the E60's top speed to just 90 mph, somewhat crippling its ability as a fast and efficient passenger locomotive. This probably also caused sales for the model to be somewhat poor (although lack of demand, in general, by the 1970s also was likely a factor). In total, General Electric sold just 73 E60s to domestic and foreign buyers. 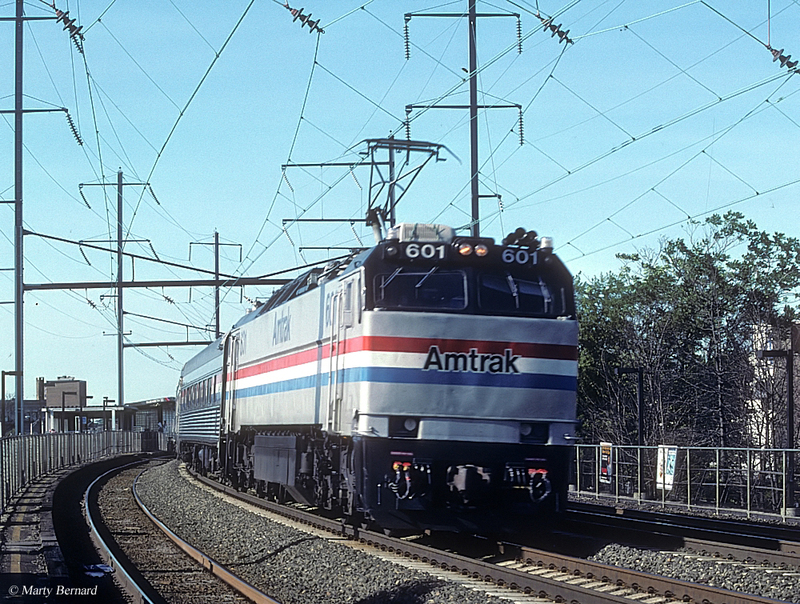 Additionally, after just 10 years in Amtrak's fleet the carrier had all of its remaining units (with the arrival of the AEM-7 model in 1984 the carrier quickly began replacing the E60s) entirely rebuilt for more efficient operation. After completion of the rebuild program the remaining eleven E60s (now classified as E60MA) all used electrical head-end power (HEP) and were numbered from 600-610. The units also weighed nearly 11 tons less than as originally built allowing them to operate more efficiently. Still, however, the model was best suited more for heavy freight service than hauling passenger cars (a reason why the model's cousin, the E60C-2 became so popular in coal service on the privately operated Deseret Western Railway). As such, Amtrak assigned the eleven to their heaviest/busiest corridors such as the Crescent and Broadway Limited running to and from New York City. For more reading about Amtrak’s E60 electrics and other electrics consider Electric Locomotives from Brian Solomon. Not only does the book give a nice overview about the Amtrak's electrified operations it also covers American electric locomotive technology in general. Another book that covers modern electric locomotives like the E60 is Locomotives: The Modern Diesel and Electric Reference by author Greg McDonnell. Mr. McDonnell's book is much larger in scope than Solomon's Electric Locomotives, covering newer electrics (and diesels) on nearly 250 pages which are packed full with excellent photography, illustrations, and diagrams. The book has received superb reviews by readers and is perhaps the best current work out there covering the topic.